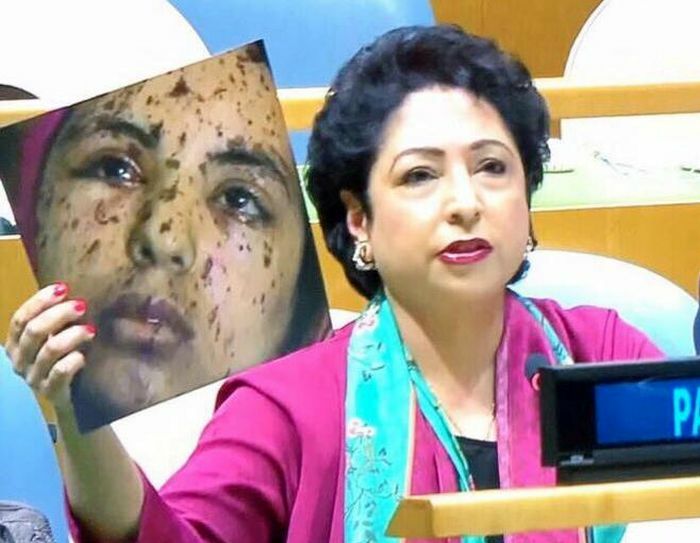 In a major goof-up, Pakistan’s Permanent Representative to the United Nations Maleeha Lodhi on Sunday flashed a picture of an injured Gaza girl with no connection to India while alleging she was a victim of pellet guns in Kashmir. Exercising her right to reply hours after External Affairs Minister Sushma Swaraj blasted Pakistan for its support to terrorism, Lodhi, on the floor of the UN General Assembly, held up a photograph of a woman whose face was peppered with alleged pellet gun wounds. “This is the face of Indian democracy,” Lodhi claimed. The picture of 17-year-old Rawya abu Joma’a of Gaza, an alleged victim of an Israeli attack was actually taken by award-winning American photo journalist Heidi Levine in July, 2014. The picture is available on multiple news websites. “Rawya abu Joma’a, 17, at the Shifa hospital in GazaCity. Rawya was wounded when two Israeli air strikes hit her family’s apartment. Three of her cousins and her sister were killed in the strike,” says the caption of the photo on the website of the UK’s Guardian newspaper. Quite evidently, the picture has no connection with Kashmir. The Permanent Mission of Pakistan to the UN also did not immediately respond to a question on Lodhi’s apparent use of such a picture.